Me at the Ofen Bar. This photo was taken from the back row. Jokes, it was from about the second or third row from the back. 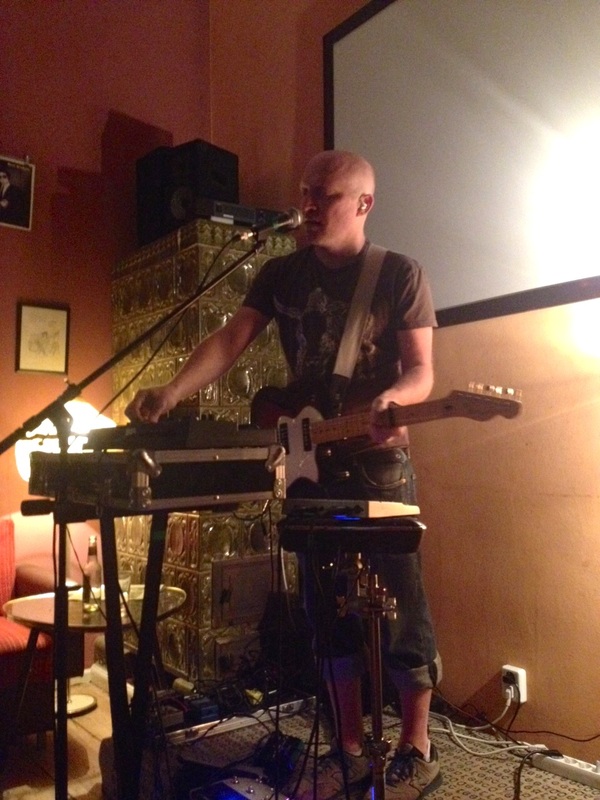 I played a super cool gig at a super cool little bar last night. The place is called Ofen Bar (Misu&Musi) and I think it is the smallest and cosiest place I have ever played. The capacity must be about 15 people but the atmosphere and audience are awesome. Also on the lineup was the Italian blues/folkster Matteo Tambussi who has some great tunes that he played on an overdriven twelve-string acoustic and he has a voice that reminds me of Freddy Mercury in his lower ranges. I’ve also come up with a great idea! Because my show has quite a regular structure (with all my gear, etc, it kind of needs to be that way so that I can remember everything) I think it would be possible to make a live video over the next few months by asking the audience at each show to film short video clips on their phones which they can email to me and which I can then splice into one long video. I will also have the live recording which I will be making this Sunday at the Culture Container to use at the basic sound track. What do you think of that?! I think it will be awesome!! !